Lately I've been indulging myself in building a presence on Twitter. Part of this has involved creating an alter ego in the form of a Sith in the Star Wars universe with origins hearkening back to the samurai of some ancient time in a galaxy far, far away. To this end, I wanted to set up a profile suited to such a character, an individual serving the Galactic Empire and the Dark side of the Force, yet at the same time having embraced the life of a samurai to some extent. 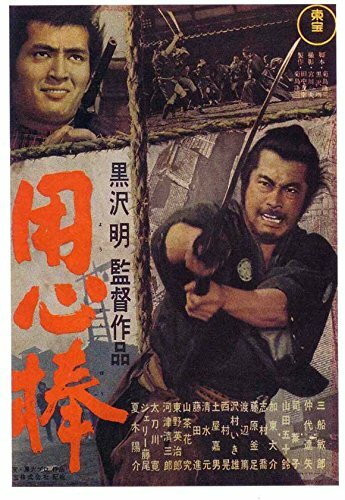 I found my fictional muse in Yojimbo, a disenfranchised samurai (or ronin) played by the inimitable (though Nathaniel Lees of The Matrix: Revolutions fame comes close with his character aptly named Captain Mifune) Toshiro Mifune. Movie poster for Yohimbo (1961). I decided to create a representation of Jojimbo, the character, in a fictionalized alternative universe where, say, the political mastermind Emperor Palpatine managed to take hold of the formidable propaganda of the Empire and insinuate it into popular culture. To this end, I wanted to alter the original movie poster to give it a distinctive Imperial flavor, and hint that my Twitter persona aligned with this fictional manifestation of a great, individualistic, disenfranchised samurai. There are certain physical attributes that make a Sith stand out from the inferior, frumpy Jedi. 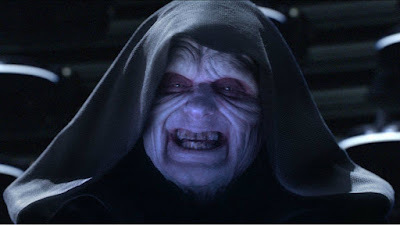 Being wracked by the powers of the Dark side, Sith experience increasingly drastic physical as well as mental changes. The irises of their eyes acquire an angry yellow glow; over time their flesh might wrinkle and fester thanks to their intimate embrace with the darkness. Importantly, the weapon of Sith and Jedi alike, the lightsaber, acquires unique characteristics depending upon the user. TheStupendousWave provides a great explanation of the canon surrounding lightsabers and how the color those glowing weapons emit relates to their wielder. In the case of the Sith, they forego crystals found and refined from natural sources in favor of synthetic ones, which result in an angry red blade rather than the more tranquil-seeming blue or green typical of the Jedi. 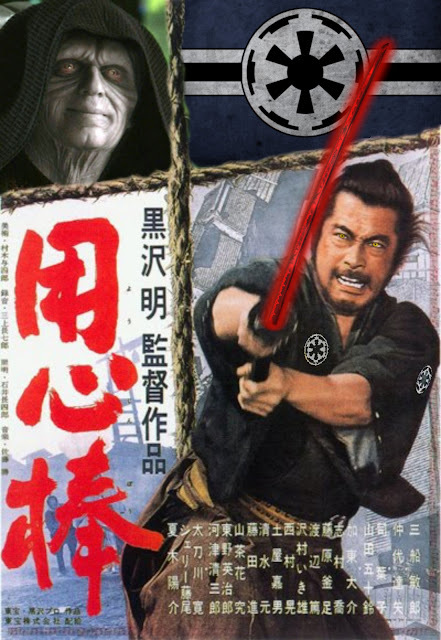 To exemplify this in my version of the poster, I wanted to give my Yojimbo an angry red lightsaber blade, yet still have it retain the shape of the katana, the traditional weapon of the samurai. 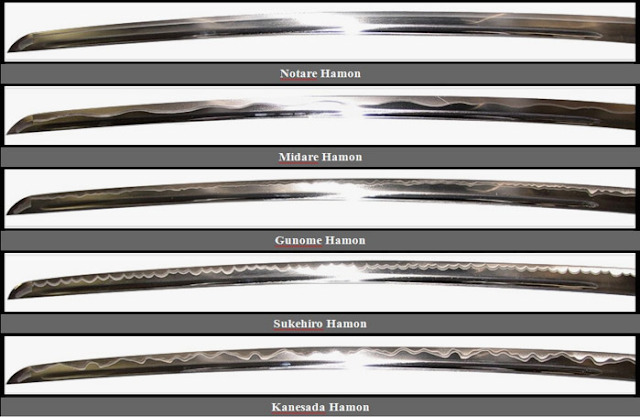 Further, I wanted to give his katana a hamon, a characteristic pattern along the leading edge of the blade. This site (natively in French) gives a number of examples of the different hamon in ancient Japan, some of which are depicted below. Cropping the katana blade and copying it to the clipboard. Pasting the katana as a new layer onto the poster, then rotating it to take the place of the original. Finally, I paste another copy of the blade as another new layer into the image, and use levels to adjust the coloration of the layers along with glow effects and blend modes between layers to add a glow effect to this katana-slash-lightsaber. Of course, I use the superior, synthetic red glow of the Sith lightsaber here; use other, inferior colors at your peril! The end result, with a few added elements (our glorious Emperor Palpatine, the Imperial logo, and the Sith's distinctive yellow irises) to make the poster a bit more relevant to the Star Wars universe, turned out nicely.